This is a healthy, vegetarian meal that doesn’t skimp on flavor. I’m not talking about your average pasta and sauce recipe. 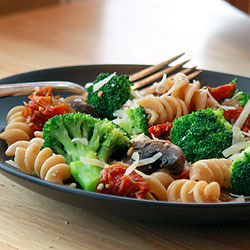 What we’ve got is strong flavors sautéed and reduced with some veggies and then mixed with whole wheat pasta and a sprinkle of intensely flavored Asiago cheese. You’ll never guess the key ingredient; it’s anchovies. If you're not into fish, keep reading, I have a plant based substitution. Now, I realize most Americans are terrified at the idea of these little fishes, however, pretty much all of Asia and Europe know how to enhance flavors with fish. The best pork loin I’ve ever had, had anchovies fillets in the three pepper sauce. It doesn’t take much anchovy to bring depth of flavor to a any savory dish. I recommend anchovy paste (you'll find it next to capers and olivesor with Italian Foods ) or fish oil (look in the Asian food section) then you won’t have to figure out how to store part of a leftover tin. If I haven't sold you on the anchovies, condsider using chopped black olives, about a quarter cup or two tablespoons capers. Both have bold flavor to keep this dish from the land of bland. 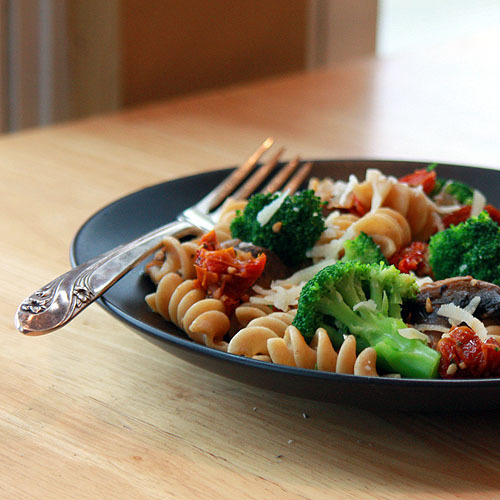 This recipe is based on Chicken and Broccoli with Sun-dried Tomatoes Pasta from Cooking Light by Cook’s Illustrated. I did do some tweeking. To make it vegetarian I replaced the chicken with mushrooms and the chicken broth with vegetable broth. I use button mushrooms, but if you can find porchini or shitaki I bet they would be even better. Also, it called for olive oil packed sun-dried tomatoes rinsed and patted dry. Seems like a waste of good olive oil. I'd save the oil and add it back into the sauce when the four teaspoons of olive oil are called for. As it was, I dehydrated cherry tomatoes last summer and froze them. They worked beautifully in this recipe. I also had some basil I minced and froze in ice-cubes in October that I subbed for the fresh basil. The flavor isn't quite as good as fresh, but it's still much more vibrant than the dried herb. This recipe is perfect for a week night meal. It comes together in about 30-40 minutes. For the two of us, we get two dinner servings and two lunch sized servings from this recipe. It makes quite tasty leftovers warm or cold. Bring 4 quarts water to boil in large pot for broccoli and pasta. Meanwhile, heat 1 teaspoon of olive oil in 12-inch nonstick skillet over medium-high heat until just smoking. Add mushrooms and cook until they just start to darken, about 5 minutes. Add onion, sundried tomatoes, garlic, pepper flakes, fish sauce/paste and olive oil. Return skillet to medium-low heat, cover, and cook until onion begins to soften, about 5 minutes. Stir in broth and continue to cook, covered, until tomatoes have softened, about 2 minutes. Remove lid and simmer until mixture has thickened slightly, 3 to 5 minutes; cover and set aside off heat. Gently stir mushrooms, broccoli, basil, Asiago, sauce, and remaining 2 teaspoons olive oil into pasta. Cover and let sit off heat until sauce and mushroom are hot, about 1 minute. Add reserved pasta cooking water as needed to loosen sauce. Season with salt and pepper to taste, serve. It looks delicious, but doesn't the inclusion of fish sauce or anchovies render it not vegetarian? I absolutely think this dish sounds splendid- even though I'm not a vegetarian! So healthy and delicious- what's not to love?! It true there are different ideas of vegetarian. If you don't eat fish, perhaps I'd recommend adding 1/4 cup minced black olives or 2 tablespoons capers. Mmmm....this is my kind of meal! This is not vegetarian. Fish are not vegetables. This looks adorable. I absolutely love mushrooms, any kind of mushroom so I would eat them in any possible combination. My mom taught me to eat broccoli and I must admit I learned to like it. But my favorite ingredient from this recipe is definitely pasta. Thanks for sharing this great recipe.